When you travel, one of the first things you probably think about is the photos that you’re going to take and what you’re going to do with them. Perhaps you’re looking for just the right family photo on your tip to send out at Christmas, or perhaps you’re just looking for a way to document all of your memories. Either way, travel and photography have become virtually synonymous over the last several decades. Whether it’s a professional-grade camera or just a camera phone, people are snapping photos all over the world and for every trip. If you’ve ever been disappointed when you got home from vacation to find your photos are so-so and don’t really capture the spirit of your adventures, you should know you’re not alone. A lot goes into the photos that appear in National Geographic and other travel magazines. But you can always improve your photography skills. 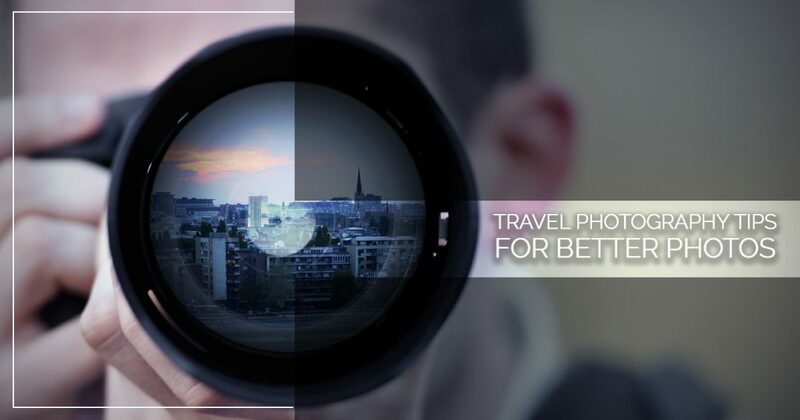 Follow the following tips in order to get better travel photos that you can be proud of when you return home. It doesn’t matter if you’re taking a trip to Israel or if you’re traveling to Florida, it’s important to be respectful no matter where you go. In countries and cities with deeply religious roots, this becomes even more important however. Whenever you’re photographing, it’s important to know when it’s okay to take a photograph and when you should probably hold off. Also, follow the directions of any signage. If a church has a sign at the entrance not to take photographs, respect the sign and don’t. Along the same vein, if there is signage telling you not to walk somewhere or cross some boundary, follow the rules. If you’re a stickler about having your photograph taken, image how other people feel in cities with heavy tourism. If you’re looking to make a portrait of an individual, make sure to ask first. More often than not, they’ll be pleased that you took the time to ask and have no problems with it. In heavily religious cities, this is important because some religious groups don’t like to have their photos taken due to their beliefs. People are an integral part of any trip, so you should feel okay taking pictures with locals, just try to remember to be respectful and courteous because it will get you a lot farther in your portrait work. Packing for a trip, especially an overseas one, can be tricky in and of itself. Trying to pack the right camera gear can be even tricker. You don’t want to be weighed down with camera gear, but you also don’t want to forget anything important. As long as you have the essentials, you’re going to be okay. So, don’t forget your camera, extra memory cards, batteries and battery charger, and we highly recommend a wide angle lens if you have a DSLR. Something else that isn’t required, but can come in handy, is a lightweight tripod. Just make sure all these items make it into your bag. If you ever think that National Geographic and Conde Nast travel photographers are just lucky and end up in the right place at the right time by happenstance, think again. All those amazing photos that you see typically have a lot of planning and research that going into making them. Do your research prior to your trip to Israel to help you figure out the best areas to photograph and any other interesting information that’s going to help you along the way. In the same respect, don’t be afraid to ask locals plenty of questions too. On the spot research can also pay off when it comes to photographs. It’s far too easy to just snap a picture of any foreign local and then move on. And while you may want to do that for some locations because you’re pressed for time or you just need an “I was here” picture, if you have the opportunity, make time specifically to take photos. When you take your time, you’re able to work a situation or location so that you can create new and interesting photographs. You’ll be able to see things differently and patiently if you make a point not to be in a rush. Good photographs take time, so make sure you give yourself a bit of that during your travels. When people go on vacation, they sometimes opt to sleep in and spend the entire time relaxing. That’s perfectly fine, however, if you’re looking to make some beautiful photographs, it’s worth getting up to go exploring. When you get off the beaten path and explore when there is good, natural light out and fewer tourists, we guarantee you’re going to love the results. Take the time to wander around the city (with a map in your pocket of course) and try out new restaurants and areas. See if you can find where the locals frequent and what the city actually feels like away from tourist sites. You’ll enjoy getting to know the local culture and find that your photos will be all the better for it. If you’ve ever had experience traveling and photographing, you know how important the right clothes can be. You don’t want to wear a photographer’s vest and sandals when you’re out and about. Instead you’re going to want comfy shoes for exploring and clothes that allow you to easily blend in with the locals, even if you have your camera on you. Not only will this help deter thieves from trying to nab your camera, but it will also make it much easier to get more intimate shots of the local culture. You’re less likely to be pegged as a tourist at any of the tourist sites you visit, and you can enjoy your travels in peace when you dress appropriately. It also helps to have dressed appropriately when you go for that crazy shot where you have to climb on a table and reach up high with your camera. You’ll be glad you did. You’d be surprised to find out how accurate your natural instincts may be for photographs and for your personal protection. Trust your instincts when you’re traveling and photographing. This means that if you see a possible photographic gem unfolding, take the time to pursue it. If your instincts tell you that you shouldn’t be photographing due to the religious nature of a site, listen to them. If you feel uncomfortable in any situation, listen to that feeling and wander back towards your group or towards help. Let your instincts guide your photographic journey and you’re sure to be pleased with the outcome. If you’re considering a trip to Israel, whether to see the sites or take some incredible photographs, let World Express Travel be your first choice for planning your vacation and unique Israel experience. We’re the premier travel agency for trips to Israel and you’ll be satisfied with your experience. Turn to us for group religious tours or customized family vacations. Contact us today and ask about our current deals! And of course, don’t forget your camera when you pack for your trip to Israel.